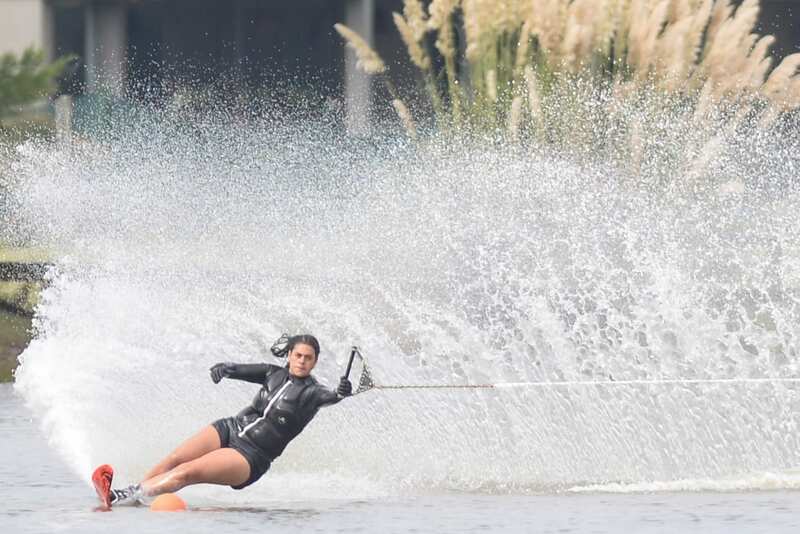 Individual waterski titles were awarded in all 4 medal disciplines at the 2019 South American Beach Games. In women’s slalom, Fernanda Naser from Chile won the gold medal with 1.5 buoys on the 12 metre line followed by Paloma Giordano from Argentina and Negrao Juliana Ramona from Brasil. Correa J. Santiago from Colombia won the gold medal in men’s slalom with a score of 4 buoys on the 11.25 metre line ahead of Andres Artadi Mario Mustafa from Peru and Tobias Giorgis from Argentina. As expected, Peru’s Natalia Wiese Cuglievan 8,170 points won women’s trick gold medal and Felipe Belmont Franco 11,260 points won the men’s trick gold medal. Peru’s Alejandra Bedoya Maria De Osma won the women’s jump gold medal with a 37.4 metre jump and the favourite in men’s jump, Rodrigo Miranda from Chile, won the gold medal with a 59.5 metre jump having gone 65.3 metres in the preliminary round. In addition to jump gold medals, Alejandra Bedoya Maria De Osma from Argentina and Rodrigo Miranda from Chile also won gold medals in overall.